Meet our Winter Village All Stars, young New Yorkers who have been honored by Bank of America Winter Village for giving back to their communities. Each All Star was nominated by an adult in their life and 10 finalists were chosen. Today we highlight one of our noteworthy young All Stars! Awa Mbaye is a 13 year old from Harlem who commits her time and energy to the students, families, teachers and staff at M.S. 245, The Computer School, which she attends. She is an 8th grade peer leader and helps mentor other students while leading school tours and engaging new families at her school. She was nominated by her teachers who cited her positive attitude and belief that giving back to one’s community should be the norm. 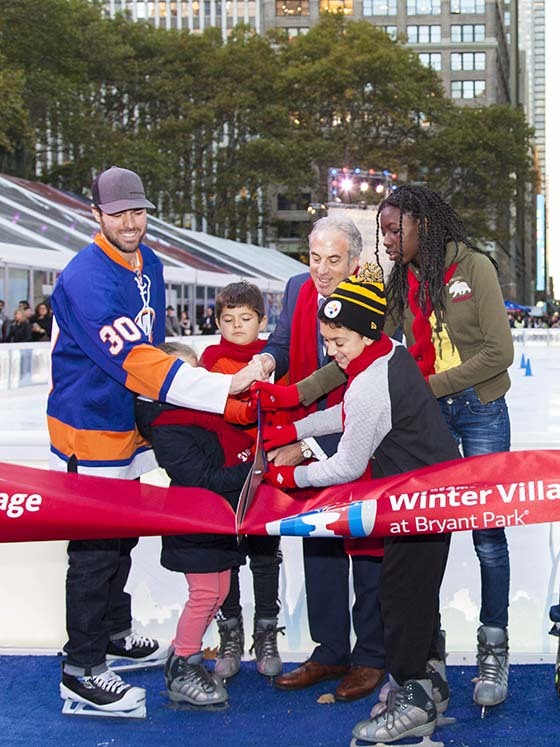 Winter Village All-Star Awa (far right) helps cut the ribbon at Winter Village opening day with fellow All-Stars, New York Islander Jean-François Bérubé, and Jeff Barker, the New York President of Bank of America. 1. What is your favorite wintertime activity? I enjoy making snowmen and making gingerbread houses. 2. What is your favorite wintertime snack? 3. Describe your community service activity in three sentences. I help out at my school for any event that goes on. I help with barbecues, dances, open houses etc. I also sometimes like to go with my sister and help them plant flowers for the elderly homes. 4. Why do you enjoy your community service? I like doing Community service because it feels good knowing that I did something good for other people. 5. What would your superpower be? My superpower would be to fly. 6. Pick 3 words that describe you.